The earliest known reference to the Farmer’s Boy is in 1862, although it is believed to be older than that. Papers for the Crown Brewery, owned by Thomas Driver Medcalf of Ware Road and Railway Street in Hertford, show that the Farmer’s Boy was known as the Woodman until sometime before 1871. Kelly’s Directory of 1870 lists by name the Farmer’s Boy as a public house, run by Thomas James Harrison; up until then it was listed in Kelly’s simply as an unnamed beer house. In 1885 Thomas Harrison and George Bird appear to have been the tenants. The present building includes what was originally the pub as well as a small cottage, a stable and a shed. The Crown Brewery, including the Farmer’s Boy, was sold to Percy Hargreaves of Abridge, Essex, in about 1885, and in 1895 Benskins purchased the brewery and closed it. Hertford Museum has a copy of sale particulars, dated 16 December 1895, for the Crown Brewery and nine public or beer houses including the Farmer’s Boy, which contained bar and parlour, tap room and cellar; kitchen and 5 bedrooms, stabling, gardens and outbuildings; also a cottage let to a Mrs Bird. 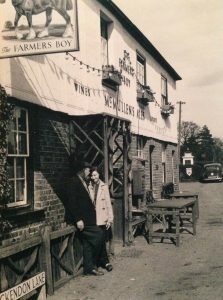 At some stage the Farmer’s Boy was acquired by the Waltham Abbey Brewery since McMullen’s purchased the Waltham Abbey Brewery, including the Farmer’s Boy, in July 1898. In 1918 the keeper was a Miss Elizabeth I Webb, and in 1937 it is Robert John Brighty. McMullen’s sold the Farmer’s Boy in October 1990, when it closed for refurbishment and reopened as a free house in 1992. As of February 2017 father and son, Kevin & Mitch Brummitt own and operate the site. 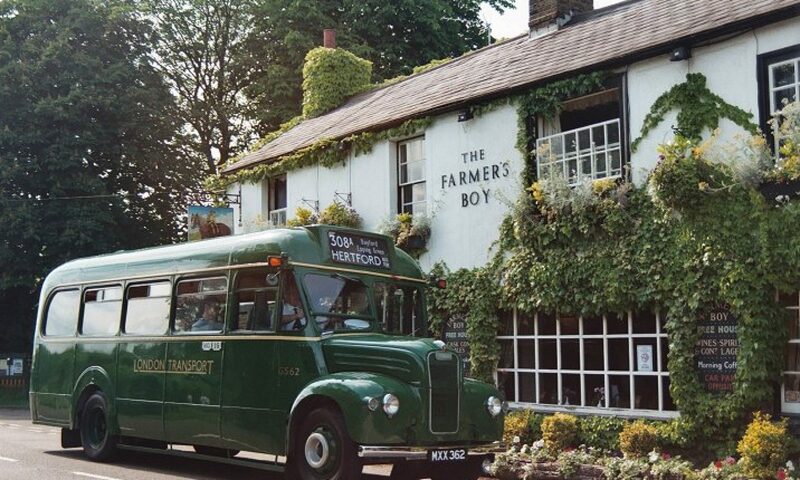 All of the events at the Farmer’s Boy centred on a Hertford girl who had gone there to work. The girl considered herself to be psychic and the pubs spirits soon let her know that they were around. Every morning when the staff came down to open up the pub they would find that the beer had been turned off and that the cellar had been rearranged into what they classed as an old fashioned arrangement. One spirit, thought to be that of a mischievous child would sit on the dessert freezer and refuse to get off until asked so that the lid could not be lifted. Things would be moved around in the kitchen and the spirits appeared not to like having things on the walls. In one bedroom knocking was heard on the wall and something tried to open the door but failed. Instead the figure just walked through the wall. On one occasion the girl awoke during the night to hear her dog whining at the door at the bottom of the stairs. She went down to let it out but the door would not open and no amount of banging would attract anyone’s attention. Returning to bed she found the room bitterly cold so she and the dog hid under the bedclothes. Half an hour later a friend came upstairs, the door was not locked. On another night the girl was sitting in her car outside the pub when the saw the bar lights come on and a figure walk up to the optics and help himself to a drink. She knew everyone was in bed and when the figure came over to the window she could see that it wasn’t one of the regular bar staff. She described him as a man in his forties with scruffy ear length hair who stared at her with intense eyes. The man started talking to her in her head and continued to do so until she was well away from the pub. No accounts of witchcraft in Brickendon have been discovered. However, in 1603 Agnes Whittenbury of Aston was charged on two counts of causing illness by witchcraft and one count of bewitching two piglets; she was found guilty and hanged. We are pleased to report that other than some strange sightings and noises now and then, which might be expected from a building over 200 years old, no other activity has taken place under our ownership!